In a long interview*, Traudl Junge told the story of her childhood and the circumstances that led to her becoming secretary to Adolf Hitler. All through the interview she gave me the impression of being a very sympathetic person. She spoke over and over again about being near to the centre of power and yet being completely oblivious as to the true character of the Nazi ideology. She said that it was as if there was a huge explosion going on in the world but that there, at the centre, it was not only still, it was also absolutely isolated. This was, she explained, partly because nothing difficult was ever spoken about in deference to Hitler’s refusal to face opposition or bad news. As the interview neared its end, Traudl began to explore her responsibility in relation to her Nazi past. She described herself as lacking the courage to allow the implications of Hitler’s behaviour to take root in her mind. She said she lacked the courage to face the fact that this all-powerful man was not after all a great personality. She acknowledged it was this inner indolence that had ensured her ignorance as to the real implications of Nazi ideology. She then described coming across the memorial to the martyred Sophie Scholl. Sophie was a girl of 21 when she died. 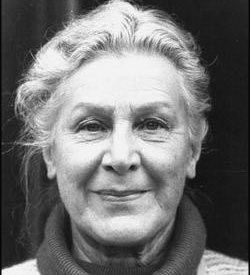 She was guillotined by the Nazi state in 1943 for her role in the non-violent resistance movement, ‘The White Rose’. Looking at the date of Sophie’s death she had a kind of epiphany. She realized that when Sophie had died she was the same age as Traudl had been when she became Hitler’s secretary. She said that she had come to see that her youth was not a good enough excuse for her ignorance. Rather, it had been nothing more than an unwillingness to think about what was happening, a deliberate strategy to remain in the dark and therefore safe from the complexity and danger of becoming an outsider. At the beginning of the interview, she says over and over again that she was stupid and young; at the end of the interview she acknowledges that this was actually a method of distancing herself from what actually had been a choice.